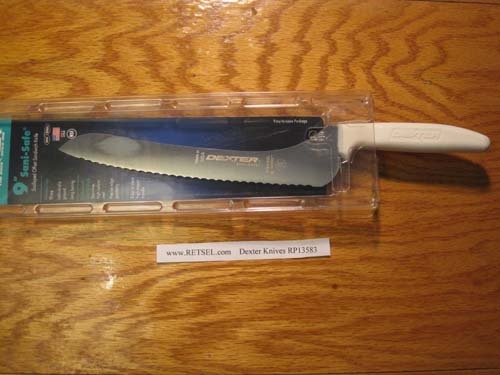 Dexter Russell 9 inch scalloped offset slicer The Sani-Safe® product line offers the foremost standard for professional cutlery. A textured, slip-resistant, easy-to-clean polypropylene handle withstands both high and low temperatures. An impervious blade-to-handle seal provides the utmost sanitary performance. Dexter scalloped blades are manufactured from proprietary DEXSTEEL™ stain-free, high-carbon steel and are individually ground to create specially designed scallops forming multiple sharp cutting edges. The points of the scallops easily break through tough rinds and pierce the firm skin of fruits and vegetables and also protect the sharp cutting edges. After breaking through the tough outer surface, the curved scalloped edges slice through soft interiors without damaging them. Made in USA. Items marked with the NSF logo are NSF Certified.